Cletus E. Jones founded Jones Scaffolding Co. in 1964. Today, it remains family owned and operated. Renowned for safety and reliability, we are committed to providing scaffolding to meet every contractor’s need. We provide high quality turnkey scaffold erection services for commercial and industrial construction industries. 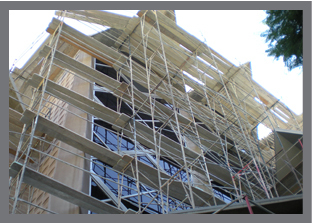 For independent contractors, we offer a full line of quality rental scaffolding at reasonable prices. We offer a full line of new and used scaffold available for purchase as well as erecting and dismantling services. Our experienced crews provide quick responses and fast turnaround for the delivery, assembly, and dismantling of scaffold to fit into your time schedule. As a founding member of the Scaffold Industry Association (SIA), we continue to be a leader in the scaffold industry. Jones Scaffold Co. operates within the association’s codes of safe practice.